The Hilux is one of the most popular vehicles in Australia for off-road driving for a good reason. It’s one of the most reliable and available off-road four wheel drives on the market. However, as an owner, it’s also your duty and responsibility to take proper care of it, as no matter how reliable it is, it’s still prone to damages caused by the environment. One of the things that a lot of Hilux owners turn to first, is the Hilux bullbar. 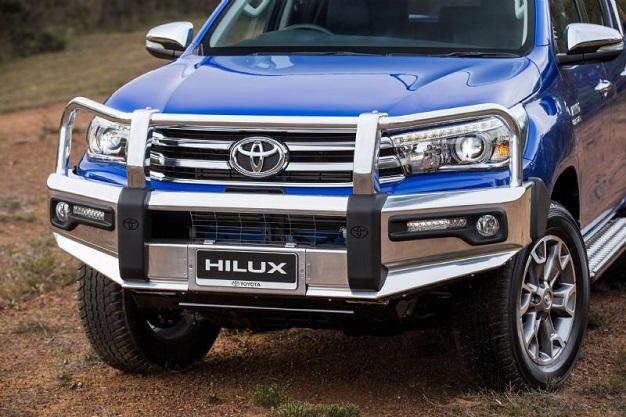 The bullbar, or grille bar, is one of the most commonly sought-after 4WD accessories as it offers a combination of adding valuable protection versus front end damage on off-road trails, job sites and other tricky situations, as well as considerably boosts the Hilux’ looks. What makes the Hilux bullbar popular, is that there’s a specific type for every Hilux make and year. This means you can attach it to your Hilux without making any modifications to it. Bullbars protect the entire front of the vehicle, including your headlamps, without obstructing any light. They prevent debris and large branches from ruining your paint job. Anyone who has participated in off-road driving will tell you that flying debris, clumps and stones are a serious danger and not something to be taken lightly. If you’re going to partake in some serious off-road adventures, then you should consider getting a bullbar that’s made of heavy-duty steel, it is Australian tested and certified, as well as ADR approved. Some bull bars come with a winch mount, which can be extremely useful if you get stuck in a sticky situation and need a way to pull yourself out. Besides the bullbar, another frequently bought 4WD accessory are side steps. They add convenience and functionality to your vehicle. Some people see them as an extra step to get on and off the vehicle, while others rely on them for side protection from debris and rocks. Whatever the case, they make a great addition for every off-road vehicle. Side steps can be made of various different materials. Some of the more common ones are fiberglass, plastic, rubber, and steel. Whatever material you choose, you should do your best at keeping them clean in order to prevent slipping and injury. Most types have a built-in surface that helps improve traction. You can also choose between having them on just one side of the vehicle, or both, for aesthetic purposes. Bottom line is, 4WD accessories, like bullbars and side steps, are a worthwhile investments for every off-road enthusiast. They offer both aesthetics and functionality. There’s a wide plethora of options to choose from on every front, so you won’t find yourself in a shortage of options whenever you decide to buy.